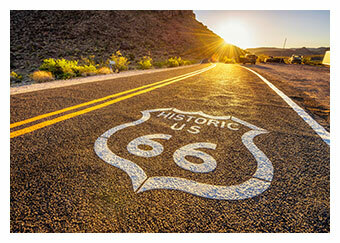 Are you craving a trip along the famous Route 66 from Chicago to LA in your dream car with America stretching out in front of you? If so, you're not alone, as new data from autoeurope.co.uk shows that an increasing number of people are hiring premium vehicles in both LA and Chicago so they can experience their 'Ultimate American Dream' in the utmost comfort, but at an affordable price. A total of 1,318 luxury cars were hired in the US and booked in the UK, marking a rise of almost two-thirds (63%) from 2016. However, the trend was most prevalent in the cities on Route 66 with premium car hires from LA rising by 167% and from Chicago 126%. This suggests luxury vehicles with excellent air conditioning and good comfort levels are especially important for those embarking on US road trips - and it helps that they're very Instagrammable and look great on the holiday snaps too. In fact, the US is the country where tourists are most likely to rent a luxury vehicle during their holiday, with 1,318 premium cars hired across the nation in 2016, compared to 808 in 2015. The vehicle of choice for the journey, which takes in eight states and 2,448 miles, was Nissan’s Maxima model, with 615 hired over the course of 2016. Praised for its smooth ride and easy handling, plus comfort in the cabin including a luxurious and roomy interior, heated seats, parking sensors and a large sun roof, it is clear to see why this model is highly coveted among those embarking on a 'Great American Road-trip'. Second place went to the Chevrolet Impala, which was hired 357 times in 2016, while the owner of the third place title is the Mercedes E Class - the most popular luxury hire car of all in several countries. The trend for luxury car hires is not limited to USA holidays with rentals increasing by around 15% across the globe in 2016. The UK is the second most popular place for luxury car hires, with 483 premium rentals recorded last year. The Mercedes E Class is the car most coveted by people in Britain, with 119 hirers going for this option in 2016. The new BMW 420 Coupe was also particularly popular, with 92 customers taking it for a spin in the UK last year. In fact, London was the third most popular city for luxury car rentals in the world, with 206 premium vehicles hired in the UK capital last year. The city just missed out on the title of second most popular city to Orlando, where 209 luxury hires were recorded. Elsewhere around the world, Italy was found to be the third most popular country to hire a luxury vehicle, with 254 rented in 2016. The nation is one of the world's biggest sightseeing hotspots, and those brave enough to take on its notoriously unpredictable roads can enjoy taking in some of the world’s most historic sites under their own steam. The city of Pisa - home of the famous leaning tower - saw luxury car rentals rise by 122% over the past 12 months. Italian tourists share Brits' current favourite model too, the Mercedes E Class, with 88 hired in 2016 compared to just 2 in 2015. However, the city with the overall greatest increase in premium car hires overall was Las Vegas, which saw luxury rentals soar by 242% between 2015 and 2016. Often referred to as the entertainment capital of the world, Vegas is another location that's popular with the US road-tripping, Instagram-using crowd, who are keen to show themselves living the life of a high-roller - however temporary it might be. A spokesperson for autoeurope.co.uk, commented: “Holidays are best when you can take life at your own pace, creating your own list of must-see destinations and hitting the open road to discover them at your leisure. However, as adventurous as we might feel, we know that on holiday it’s our chance to treat ourselves to a little luxury - even if only for a few days. “Our luxury car service means that we’ll meet you wherever is most convenient with your car, whether at the airport or your accommodation. That means you’ll be ready to drive off into the sunset whenever suits you best. "Whether you're planning your dream holiday, want to look the part for work or just want the chance to drive your dream car for the day, we'll help to make that dream come true with our bespoke service."